Vizrt and its legal entities respects your privacy and protects the Personal Data we process about you. All processing of Personal Data (as defined below) is made in accordance with the GDPR. The following describes how we collect, process and share personal data belonging to clients, business partners, suppliers and other organizations with which Vizrt has a business relationship. Vizrt will collect and process your name, address, gender, country of residence, D.O.B, email, telephone number, purchasing behaviour, company details, site usage data and platform preferences. When you access or sign up to any of the Vizrt services, activities or online content, such as newsletters, case studies, live webcasts and chats, forums, web and mobile notifications, telephone or text to Vizrt, book tickets for a Vizrt event or create an account using the Vizrt online registration system we may receive personal information about you. This can consist of information such as your name, email address, postal address, telephone or mobile number, gender or date of birth, as well as information collected about your use of Vizrt services (such as what you read, watch or interact with on the vizrt websites and platforms).Please note that sometimes we will require you to provide additional personal information, and sometimes sensitive personal information (e.g. if you're sending in an application for a job or submitting a specific support request. When we do this, we will provide further information about why we are collecting this information and how we will use it. When you contact us (online or offline) in connection with a request for information, to order a product or service, to provide you with support, or to participate in a forum or other social computing tool, we collect information necessary to fulfill your request, to grant you access to the product or service, to provide you with support and to be able to contact you. For instance, we collect your name and contact information, details about your request and your agreement with us and the fulfillment, delivery and invoicing of your order and we may include client satisfaction survey information. We retain such information for administrative purposes, defending our rights, and in connection with our relationship with you. When you provide your name and contact information to register in connection with such a request, the registration may serve to identify you when you visit our websites. For ordering of most services and products we require you to have registered a Vizrt Account. Registration may also allow you to customize and control your privacy settings. Vizrt collect information about your use of Vizrt services to enable product features to operate, improve your user experience, tailor our interactions with you, inform our clients on the overall use of the services, provide support and improve and develop our products and services. In order to deliver performance of service, Vizrt will collect the following Personal Data from users of the Vizrt University training platform: Name, address, gender, country of residence, D.O.B, email, telephone number, purchasing behaviour, company details, site usage data including exams taken, grades and certification, and platform preferences. In order to provide the best possible service, Vizrt will collect the following Personal Data from users of the Vizrt forums: Name, address, gender, country of residence, D.O.B, email, telephone number, purchasing behaviour, company details, site usage data including public posts, digital Communication and platform preferences. In order to deliver performance of contract, Vizrt will collect the following Personal Data from users of the Vizrt product demos and Free Viz Artist: Name, address, gender, country of residence, D.O.B, email, telephone number, purchasing behaviour, company details, site usage data including public posts, digital Communication and platform preferences. ‍When we process your Personal Data for enhanced user experience, we do so based on your consent. Your consent is collected by checking the boxes below or through the drop down consent forms shown to all first time visitors to Vizrt platforms. You may also withdraw your consent at any time by contacting us at privacy@vizrt.com. Please note that this may result in us not being able to fulfil our commitments to you. Vizrt is a multinational company with cross-border, cross-functional teams, and our employees frequently travel while still needing access to data in order to perform their duties. As Vizrt is a global company your Personal Data will be accessible from countries outside of EU/EEA, predominantly, but not limited to, our global offices in America, Thailand, Argentina, Australia, China, India, Indonesia, Japan, Korea, Brazil, Malaysia, Dubai, Myanmar, Hong Kong & Macau, Philippines, Russia, Singapore, South Africa, Taiwan, Vietnam. These countries may have a lower level of protection than within the EU/EEA. When transferring Personal Data to countries outside the EU/EEA, Vizrt ensures that your Personal Data is subject to an adequate level of protection, providing appropriate safeguards where necessary. Please be aware that in certain circumstances, personal information may be subject to disclosure to government agencies pursuant to judicial proceeding, court order, or legal process. We may also share your personal information to protect the rights or property of Vizrt when we have reasonable grounds to believe that such rights or property have been or could be affected. 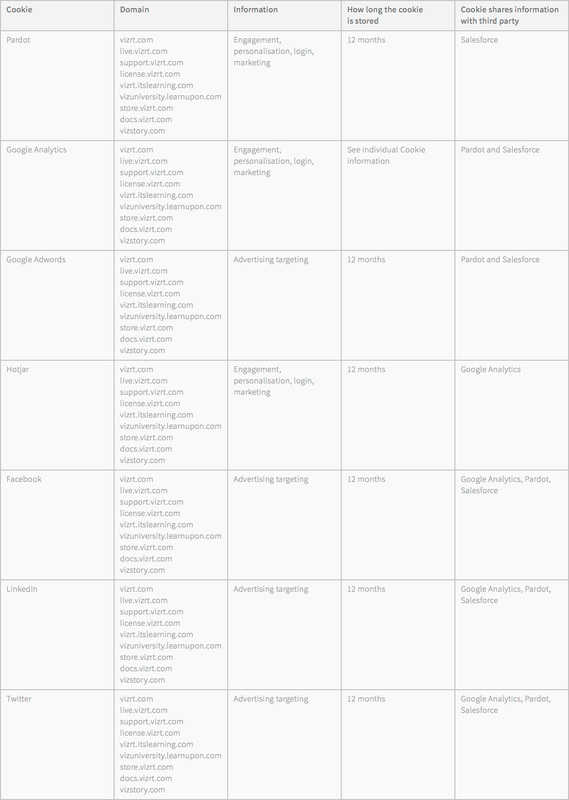 The standard contractual clauses for transfering data can be found here. We have implemented appropriate technical and organisational measures to protect your Personal Data against loss or unlawful access. The number of persons with access to your Personal Data is limited. Only employees or other individuals associated with Vizrt org that need to process your Personal Data in accordance with the purposes above will have access to your Personal Data. Vizrt will not retain personal information longer than necessary to fulfill the purposes for which it is processed, including the security of our processing complying with legal and regulatory obligations (e.g. audit, accounting and statutory retention terms), handling disputes, and for the establishment, exercise or defense of legal claims in the countries where we do business. You are entitled to know what Personal Data we are processing regarding you, and you can request a copy of such data. You are entitled to have incorrect Personal Data regarding you corrected, and in some cases you may request that we delete your Personal Data (if, for example, the Personal Data is no longer necessary for the purpose for which it was collected or if you withdraw your consent and the processing was based on such consent). You also have the right to object to certain processing of your Personal Data, and request that the processing of your Personal Data be limited. Please note that limitation or deletion of your Personal Data may result in us not being able to fulfil our commitments towards you. You are also entitled to extract your Personal Data in a machine-readable format and to transfer the Personal Data to another controller. If you have questions regarding how we process Personal Data concerning you, you are most welcome to contact us at privacy@vizrt.com or by mail to the address above. If you have any objections or complaints with the way we process your Personal Data, you have the right to lodge a complaint with the [insert relevant data protection supervisory authority]. A “cookie” is a small text file containing information which is stored on your computer. Cookies are only used for technical reasons and to facilitate your use of a website. One type of cookie will save a file permanently on your computer. It can thereafter be used to customise this website based on the user’s choices and interests. Another common type of cookie is the “session cookie”. 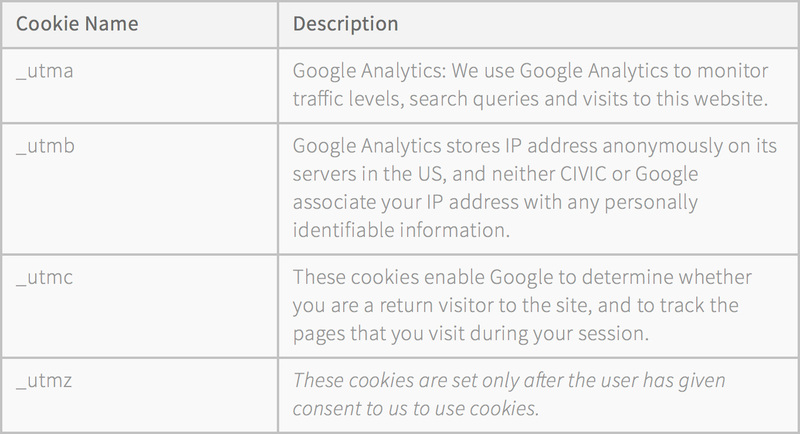 When you visit a website, session cookies are sent between your computer and the server to collect information. Session cookies are not saved once you close your web browser. For more information about how cookies work, please be referred to www.allaboutcookies.org. Visitor Cookie: The visitor cookie includes the name “visitor_id” plus the unique identifier, which is derived from the tracking code placed on your site. The value stored is the unique ID for the visitor. For example, cookie name “visitor_id12345″ stores the visitor value “123456789,” where 12345 is the account identifier and 123456789 represents the visitor ID. 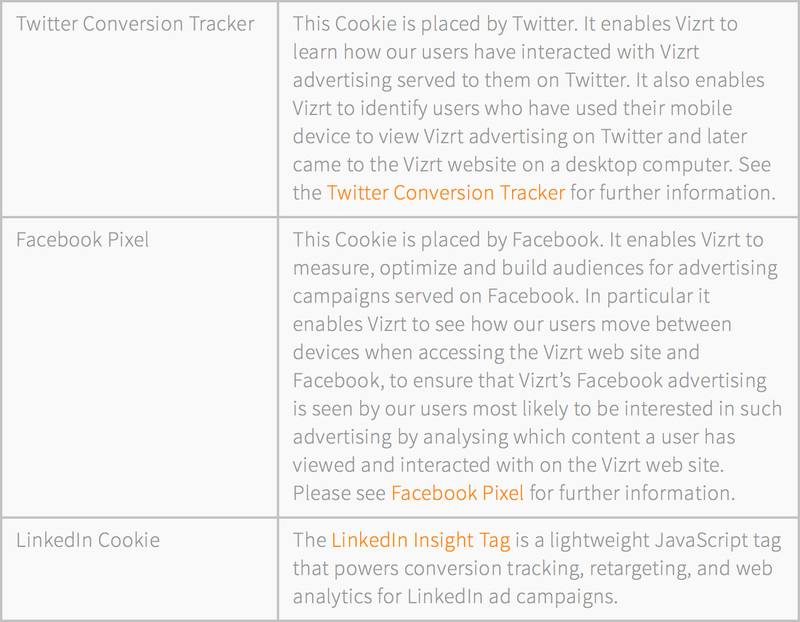 This cookie is set by our tracking code on visitors and prospects. Opt InCookie: The persistent cookie named “pi_opt_in” is what we use to stay in compliance with the “Do Not Track” initiative. 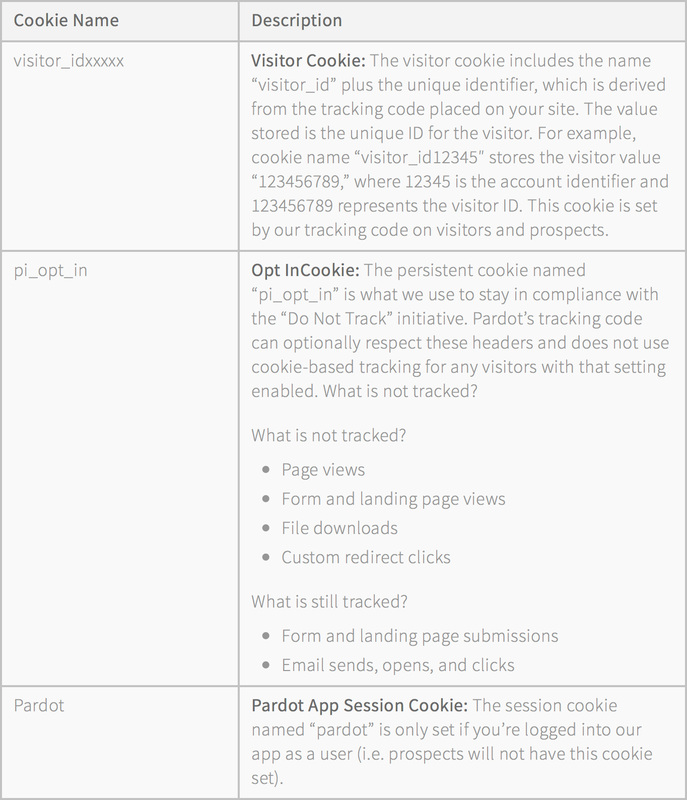 Pardot’s tracking code can optionally respect these headers and does not use cookie-based tracking for any visitors with that setting enabled. What is not tracked? Pardot App Session Cookie: The session cookie named “pardot” is only set if you’re logged into our app as a user (i.e. prospects will not have this cookie set). This Cookie is placed by Twitter. It enables Vizrt to learn how our users have interacted with Vizrt advertising served to them on Twitter. It also enables Vizrt to identify users who have used their mobile device to view Vizrt advertising on Twitter and later came to the Vizrt website on a desktop computer. Please see the Twitter Conversion Tracker for further information. This Cookie is placed by Facebook. It enables Vizrt to measure, optimize and build audiences for advertising campaigns served on Facebook. In particular it enables Vizrt to see how our users move between devices when accessing the Vizrt web site and Facebook, to ensure that Vizrt’s Facebook advertising is seen by our users most likely to be interested in such advertising by analysing which content a user has viewed and interacted with on the Vizrt web site. Please see Facebook Pixel for further information. Some cookies are strictly necessary in order to enable you to move around the website and use its features. 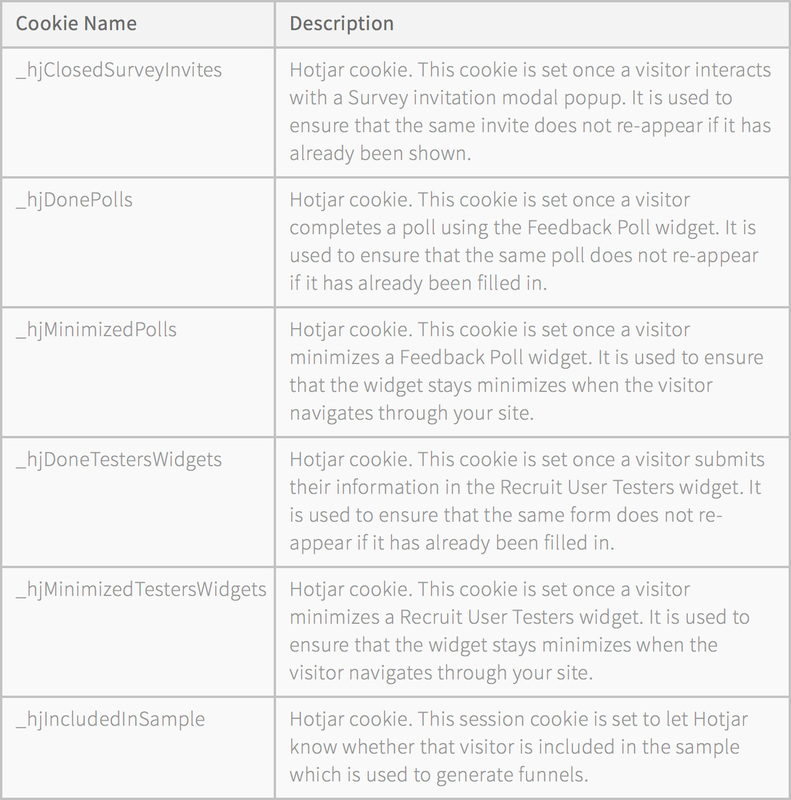 Without these cookies, we will not be able to determine the number of unique users of the site or provide certain features, such as automatic registration for downloads. These cookies collect information about how you use our sites, for example which pages you go to most often and if you get any error messages from certain pages. These cookies are not used to target you with online advertising. Without these cookies, we cannot learn how our sites are performing and make relevant improvements that could better your browsing experience. These cookies allow our sites to store information that you provide such as your site language preferences and to store technical information useful for your interactions with our sites. For instance, they remember elements of your user profile. They also ensure that your experience using the sites and Vizrt marketing efforts are relevant to you. They may also be used to provide services you have asked for such as watching a video or commenting on a blog. The information these cookies collect may be anonymous and they cannot track your browsing activity on other websites. Without these cookies, a website cannot remember choices you have previously made or personalise your browsing experience. These cookies may be used to deliver advertisements or promotions that are more relevant to you and your interests. They may also be used to limit the times you see an advertisement as well as help to measure the effectiveness of the advertising campaign. Although these cookies may track your visits to other websites, they do not usually know who you are.Without these cookies, online advertisements you encounter will be less relevant to you and your interests. You have the ability to accept or decline cookies. Most internet browsers automatically accept cookies, but you can usually modify your browser settings to decline cookies or to notify you when a cookie is being placed on your computer. Additionally, Vizrt will publish a consent checkbox shown to new users on all Vizrt platforms. If you do not wish to accept cookies, you can change your web browser’s settings to automatically deny the storage of cookies or to inform you when a website wants to store cookies on your computer. Previously stored cookies can also be deleted through the web browser. More information can be found through your web browser’s support pages. Please note that certain areas and functions on this website require cookies and may not function if cookies are deleted or declined. For more information regarding the cookies used on this website please contact us at privacy@vizrt.com.